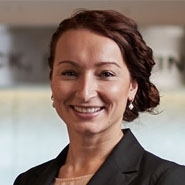 Joanna Slusarz Debski is an associate in Herrick’s Real Estate Department, one of the largest in the New York City metropolitan area. Joanna focuses her practice on financings, sales and acquisitions of various types of commercial properties. She also advises owners and tenants in office, retail and industrial leasing matters throughout the U.S.
Joanna is an integral part of the entire transaction lifecycle, helping Herrick's clients close their deals and further their business ventures. She regularly drafts and negotiates leases, purchase and sale agreements, loan agreements and ancillary loan documents. She also reviews title work, leases and other due diligence items as part of the commercial real estate closings she handles. Most recently, Joanna has been focusing her practice on representing lenders in connection with construction loans. Joanna has written several articles for various legal publications. Her law review note, “No Fishing Poles Allowed at the Office,” was published by the Defense Counsel Journal and is listed as a Legal Scholarship by The Sedona Conference’s Cooperation Proclamation.